Martin unveiled their new 2019 NAMM models in Anaheim on Thursday, January 24th at 1pm. Many were also on display at the Martin Factory and Maury was rolling tape all day! We have lot of high-res pics are on our Facebook page! Another magnificent offering from C. F. Martin & Co., including guitars of many sizes, designs, and at every conceivable price point. 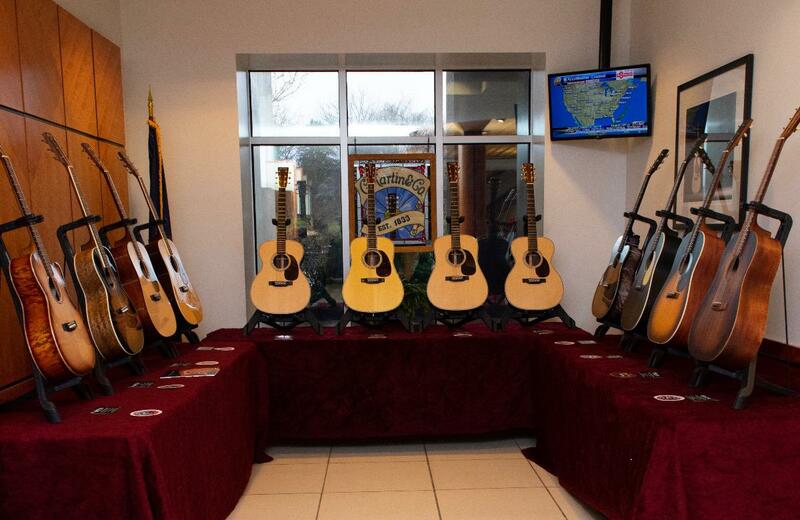 The Martin Guitar Company is a family-owned business that was founded in 1833 by the inventor of the American guitar. These new guitar offerings represent 186 years of innovation and tradition handcrafted quality at the highest level, by what is now the most celebrated and revered maker of acoustic guitars in the world. Maury’s Music is proud to be one of Martin’s most successful and Certified Online Dealer. We look forward to serving you and helping you find your way to the Martin guitar of your dreams. We'll give you expert advice from a player's point of view. Martin’s revolutionary Modern Deluxe Series explodes on the scene with deluxe versions of classic Standard Series models, infused with vintage Martin tone and feel that is further enhanced by ultra-modern advancements in guitar technology previously available only on exclusive limited editions. The first models released in this groundbreaking new series are two dreadnoughts, the D-28 Modern Deluxe and the D-18 Modern Deluxe; and two Auditorium size models, the long-scale OM-28 Modern Deluxe and the short-scale 000-28 Modern Deluxe. Learn more about all these amazing vintage and futuristic specifications in the Modern Deluxe Series. Martin’s commitment to their popular Road Series of affordable acoustic-electric guitars for gigging musicians has been renewed, and the entire series has received a refresh much like the Standard Series refresh of a year ago. And now Martin’s time-honored naming convention of Body Size – Design Style has been extended to the Road Series in the newly-christened Style 10, Style 11, Style 12, and Style 13. And with them come bold new looks, and brand new Fishman® MX-T electronics with a much welcomed on-board tuner! Martin’s full-bodied Slope Shoulder 14-fret Dreadnought models have been held to only a few Special Edition and Limited Edition models. But no longer! As of NAMM 2019 we have the super-cool DSS-15M Streetmaster® with the uniquely “woody and pretty” tone of the Martin 15 Series and the golden sunset evening and moonlit night stylings of the ever-popular Martin 17 Series, personified in the brand new DSS-17 Whiskey Sunset and DSS-17 Black Smoke. Buy the latest design by C. F. Martin IV, the CEO-9, or own a collectable piece of guitar history from 2019’s selection of Special Editions and Limited Editions, new for 2019. The Martin CEO-9 has the same 14-fret slope shoulder 00 size and Modified V neck as the very popular CEO-8. But the new one is made from curly mango! Not only that, it is used for the top as well as the back and sides!! It also has a new burst finish unique to this model and other very nice appointments, like Stule 30 colored rope top trim matched with the short-pattern snowflake fret markers of a vintage Style 42 instrument. The Limited Edition Series gets the glorious D-42 Custom with figured East Indian rosewood and a high-grade Carpathian spruce top with forward-shifted scalloped bracing, awesome flamed maple bindings, and stunning high-color abalone inlays. Inspired by Martin employees who have long-admired the dramatic finishes and sunbursts in the solid-body electric guitar world, the OMCE Blaze Burst and OMCE Shadow Burst are comfortable, versatile acoustic-electric Orchestra Models made with quilted maple back and sides and Sitka spruce tops, under either the peachy Mahogany and Translucent Blaze burst finishes, or the unique Translucent Black Burst finish. The Special Edition Series offers a collection of new and very special guitars across a wide range of prices, materials, styling and historical significance, and all with true Martin tone. “Ink meets Wood” in two related dreadnought guitars dedicated to the famed tattoo artist “Sailor Jerry” Collins, while also paying tribute the fine craftsmanship and aesthetic prowess of top-shelf guitar inlay artists. Both guitars feature the construction of the fabled Martin D-28. The D Homeward has koa back and sides and a maritime sailing ship motif, while the D True Love has East Indian rosewood back and sides, and features the hearts and roses of classic tattoos dedicated to True Love both pure and passionate as music made from world-class Martin guitars. The D-35 Woodstock 50th Anniversary model has the build of today’s D-35, with the looks of a vintage 1960’s D-35 and beautiful Peace Dove inlay on the headstock and pickguard, along with the official Woodstock 50th Anniversary logo. The much more affordable X Series features the DX Woodstock 50th model that is also a lot more colorful, with artwork like the iconic Woodstock poster from 1969. Two more X Series Special Editions mark major Martin milestones. The GPCX1AE 20th Anniversary Guitar commemorates 20 years of Martin’s breakthrough X Series, featuring alternative materials and innovative designs. The DXMAE 30th Anniversary Guitar commemorates the 30th anniversary of Martin’s manufacturing plant in Navojoa, Sonora, Mexico, with custom artwork from Robert F. Goetzl. Martin’s innovative Dreadnought Junior line has gotten a refreshing new design, including a change to 000 depth sides with softer back edges on every D Jr. model, making it all the more portable as a travel guitar, and more comfortable as a parlor guitar, or as the first “real guitar” for younger, smaller players. Now available with the new Style 10 appointments on the DJR-10 and DJR-10E Acoustic Electric model, each with sapele back and sides and a top of Sitka spruce or solid sapele. And for sunburst lovers, there’s the newly improved DJR-10 Burst and DJR-10E Burst. Please let us know what you think about Martin's new guitar models below in the comments section. We'd love to hear which guitar is your favorite! Have the Martin DJr -10 Burst and LOVE IT ! Rich sounding, well balanced sound. The battery access outside, near strap pin, is a great feature.